Considered the longest-tenured NFL head coach, Bill Belichick is the head coach of the New England Patriots for the National Football League. For a man who started his coaching career at the early age of 23, Belichick has garnered more than enough experience in the game of American Football. Since taking over at the Patriots in 2000, Belichick has won 72% of his games, taking them to a record 10 Super Bowl appearances with an equal number of victories and losses to show for it. Belichick is the only head coach in NFL history to win three Super Bowl championships in four years. The Patriots went into Super Bowl 2018 as the chosen favourites, being the defending champions and having won the franchise in the two preceding seasons. However, their wonderful track record at the Super Bowl didn’t count for them as they lost to the so-called underdogs, the Philadelphia Eagles. William Stephen Belichick was born on April 16, 1952, Nashville, Tennessee to Jeannette Munn and Steve Belichick. His father was an assistant football coach at the US Naval Academy and was one of Bill’s most important football mentors. Belichick graduated from Annapolis High School in 1970 where he played football and lacrosse, the latter being his favourite. He enrolled for a postgraduate year at Phillips Academy in Andover, Massachusetts with the aim of improving his grades and test scores to be admitted into a good college. Belichick subsequently attended Wesleyan University in Middletown, Connecticut where he obtained a bachelor’s degree in economics in 1975. In addition to being a part of the football team, he also played lacrosse and squash. His first job upon graduation was as an assistant to Baltimore Colts’ head coach Ted Marchibroda in 1975. He moved on to the Detroit Lions as their assistant special teams’ coach for 2 years and then to the Denver Broncos for the 1978 season. He joined the New York Giants on a 12-year stint in 1979 as a defensive assistant and special teams coach. Between 1991 and 1995, he was the head coach of the Cleveland Browns. Bill Belichick’s first stint with the Patriots was as the assistant head coach and defensive backs coach in the 1996 season. He joined the New York Jets in 1997 as the team’s assistant head coach and defensive coordinator. While still on contract with the Jets, Belichick was hired by the Patriots as head coach in 2000. The Patriots gave the Jets a first-round draft pick as compensation. Belichick was inducted into the Wesleyan University Athletics Hall of Fame in 2008. He was also inducted into the Athletics Hall of Honor of another alma mater, Phillips Academy Andover, Massachusetts in 2011. Bill Belichick is currently in a relationship with Linda Holliday. The couple started dating shortly after they met in 2007 at a Florida nightclub. Linda Holliday is from Jupiter, Florida and is a mother of twin daughters, Ashley and Katie Hess. Linda Holliday was a TV personality and also owned a clothing store. Currently, she is the executive director of the Bill Belichick Foundation. The foundation was launched on Belichick’s 60th birthday and helps underprivileged young people all over the world. From awarding scholarships at Belichick’s alma mater Annapolis High School, the foundation has extended to foreign countries. The couple were thought to be engaged in 2014 when Holliday started sporting a diamond ring on her left ring finger. After much speculations, she simply moved the ring to her right hand in order to put the rumours to rest. The couple has been together for so long with so many public appearances that many just assume they are married. 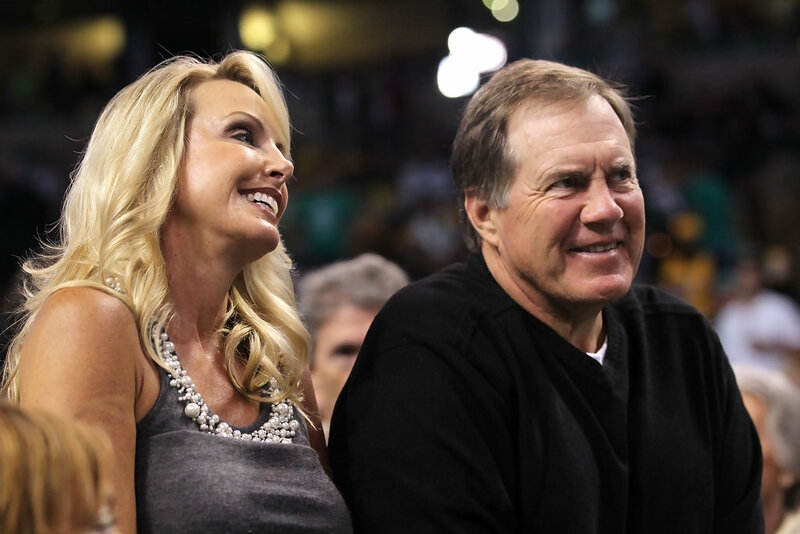 Between them, Bill Belichick and Linda Holliday have 5 children, but none together. Prior to his decade-long relationship with Linda Holliday, Bill Belichick was married to Debby Clarke for 28 years. Bill and Debby had met in their high school days, however, their marriage ended in 2006, a year before he met his current partner Linda Holliday. Debby Clarke currently runs an interior design firm in Massachusetts even as two of her children with Belichick now work for the Patriots. Their three children have all gone on to have successful coaching careers of their own, it appears that coaching runs in the Belichick bloodline. Bill Belichick has three children with his ex-wife Debby; two sons Brian and Stephen and daughter Amanda. Like his own father, Bill Belichick tried to advise his children to consider other professions aside from coaching. However, that didn’t work as all his children have followed him into the coaching profession. All three Belichick children like their father, ended up playing lacrosse in college. Bill’s oldest son, Stephen, is now the Patriots safeties coach after playing both lacrosse and football in college. In 2016, Stephen Belichick welcomed a daughter Blakely Rose making Bill a grandfather. The younger son, Brian also joined the Patriots coaching staff as an assistant during the 2017 off-season after previously working as a scouting assistant. Brian attended Trinity College, Connecticut where he also played lacrosse. The only daughter in the family Amanda Belichick, is the head coach for the Holy Cross women’s lacrosse team. No one in this family seems interested in doing anything different. With the many years of hard work he has put into his passion for coaching and getting his team to the winning side at all time, Bill Belichick reportedly has a net worth of about $35 million. Besides the huge net worth he has amassed, an annual salary of $7.5 million makes Belichick one of the highest paid coaches in sports. Bill Belichick stands at a height of 5ft 11. His chest circumference is 40 inches. His biceps are 14 inches in circumference while his waist size is 34 inches. He weighs about 92kg. Bill Belichick is currently 65 years of age.